There are many yum cha places in the island. 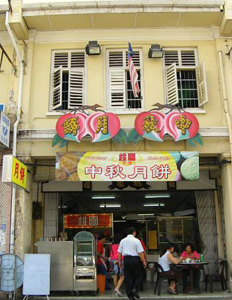 A typical yum cha place in Penang will start having customers sometimes as early as 6 am in the morning, and as demand for such an authentic culture increased over the years, some restaurants are open till late in the evening. Among the foods served in these restaurants are dim sum which can be typically found in similar restaurants in Hong Kong and Chinatowns across the world, and some of the favorites among patrons are the egg tarts, Hong Kong Chee Cheong Fun, Pei Dan Porridge and Carrot Cake. Some people may even bring their own tea collection and ask only for a teapot and hot water. Now, where can you go for a good yum cha in the island? It is in the middle of George Town, at Campbell Street. The Tho Yuen Restaurant is an authentic Chinese restaurant in one of those pre-war houses where walls are tiled and ceilings are high. The menu is handwritten in fluorescent colour papers and stuck to the walls, and all are in Chinese. The main attraction of this restaurant is its handmade egg tarts. It is not round, it is oval. The crust is thin, flaky and crispy, while the egg custard filling is not too sweet. You can say that the egg tart is the restaurant's signature dish, and a lot of time the egg tarts will be sold out by 9am. Besides the egg tarts, there are also the claypot porridge, lo mai gai, char siew bao, turnip cake, taro cake, and prawn dumplings. The waiter or waitress will go around the conference tables with the best live edge and offer food with their trolleys, these selections and many more for you to pick. If you are looking forward to it, do go early. The restaurant is opened from 6am to 3pm daily except for Tuesdays. 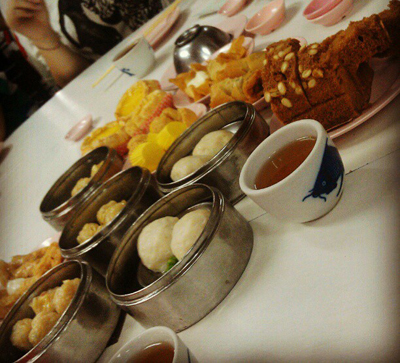 The dim sum is a breakfast meal, while Hainan Chicken Rice is served for lunch. Another famous dim sum restaurant in Penang is De Tai Tong Cafe, a very old Chinese style coffee shop in the middle of George Town. Again, this is an authentic Chinese yum cha restaurant where the food are brought before you in trolleys by the waiters or waitresses, and you can find the typical Chinese yum cha food. 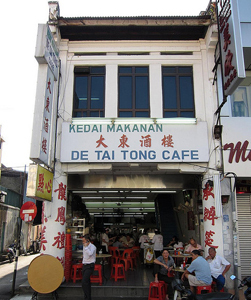 De Tai Tong Cafe is situated at Cintra Street, a corner lot of a row of pre-war heritage shop houses that is clearly visible. The favorite food there is probably the char siew bao, which is steamed bun stuffed with barbequed pork. It also serves Hong Kong styled chee cheong fun, with barbequed pork and shrimp as its fillings. This restaurant works really hard, opens daily and for long hours too. From 6 am to 12 noon, it serves dim sum, while 12 pm to 3 pm, lunch hour is a seafood tavern. After that, it rests for a few hours before it reopens again from 6.30 pm to midnight with a combination of both dim sum and seafood tavern. 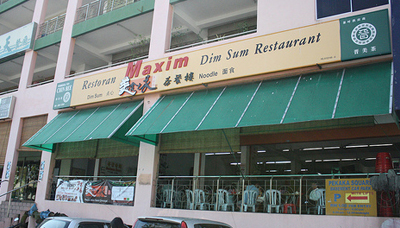 Another famous dim sum restaurant that is almost always fully occupied is the Maxim Dim Sum Restaurant at Pekaka Sungai Dua. It occupies two whole shopping lots, and still there never seem to be enough space to sit. Yet, people will just line up and not move to another restaurant, hoping that there will be people finishing their meals and moving away from the tables. Beware of its peak hours during mid mornings, where you can be almost certainly disappointed due to the crowd. While Maxim has all types of regular dim sum, it also has some special types of dim sum that may not be normally found in other dim sum restaurants such as the Almond Coated Prawn Balls. The restaurant is opened daily from 6 am to 2 pm, and closed on alternate Mondays. There are a lot of other dim sum restaurants in George Town and these are the few favorite ones by local Penangites. Just go anywhere in George Town in the morning and if you see a lot of Chinese families going into a restaurant, you can almost be sure that it is a Chinese Dim Sum restaurant. This entry was posted in Tourism & Leisure and tagged De Tai Tong Cafe, George Town, Georgetown, Maxim Dim Sum Restaurant, Penang, Tho Yuen Restaurant, Yum Cha by admin. Bookmark the permalink.